Focaccia is an Italian flat oven-baked bread product, similar in style and texture to pizza dough. It is very similar to the Greek flatbread named lagana , which I have posted some time ago. As Wikipedia describes focaccia, the basic recipe is thought by some to have originated with the Etruscans or ancient Greeks, but it is now known as a delicacy of the Ligurian cuisine. The only difference between the two flatbreads is that the focaccia dough is covered in olive oil and when the dough is ready, a lot of ingredients are added in or on top of the dough. Greek lagana is mostly treated as a flatbread, accompanying meals or for toasted sandwiches whereas focaccia is a more aromatic flatbread and is great as a snack or topped as a pizza. In ancient Rome, panis focacius was a flat bread baked in the ashes of the fireplace, (focus in Latin). The word is derived from the Latin focus meaning “centre” and also “fireplace”, the fireplace being in the centre of the house. I had some leftover whole wheat flour to use so I decided to make focaccia with the ingredients I have already used in the past and had at home. We love Kalamata olives, combined with oregano and rosemary which I have already made into Eliopsomo, which is a Greek Olive bread, and Olive Bread Sticks, Cypriot Eliopitakia (small olive pies) and Cypriot Elioti, an olive roulade. The only thing new to the ingredients used this time, is the garlic. As I have previously said I have been using garlic a lot lately and wherever I have used it I am not disappointed. I attempted to make the dough in the mixer bowl with the dough attachment but as my mixer is quite big and the quantity I made was not much it did not work, so I continued mixing (not kneading) the ingredients by hand. It turned out to be so easy that even a child can make this. Preheat your oven for only ten minutes at low temperature. Try touching the grill on which you shall put your bowl on and if you feel that it can be handled and is not hot for you to touch, then you can put your bowl in the oven, covered and leave it until it rises. I am sending this recipe off to Andrea, of Andrea’s Recipes, who is hosting Grow your Own, as the Kalamata Olives were made by me last year and the olive oil is still the same which was sent to us by our in laws. In a bowl add yeast, half quantity of lukewarm water and sugar. (To check the temperature of the water, you do not need a thermometre to do this. It’s just as simple as trying putting your little finger in the water and if you can do that, the water is perfect). Mix with a spoon and cover with a napkin until it bubbles (about 10 minutes). In a separate bowl add flour, salt, yeast mixture, 3 tablespoons of olive oil and mix. Start adding the remaining water and mix with one hand until you have a dough which does not stick on your hands and on the bowl.Add more water or flour, if necessary. Place dough in a bowl and cover with the remaining olive oil, making sure that the oil has reached the bottom of the bowl.Cover with napkin and let it rise, in a warm environment, for about 1 hour or more until it doubles in volume. When the dough is ready, place on your working surface. You do not need to dust your working surface with flour. Use some of the oil that remains in the bowl, heat it in a non stick frying pan and sauté the onion and garlic until translucent and soft.Remove from the heat and allow to cool for a few minutes. Start kneading the dough, adding the olives, oregano, rosemary, coarse sea salt, onion and garlic (without the oil). Line a pizza pan with parchment paper, add some of the remaining oil and brush the parchment paper and place dough on top and flatten with your fingers until it is about 2 cm higher.Cover and leave it in a warm place to rise again (about half an hour). Preheat oven at 180C degrees and bake focaccia for 30 minutes. Serve hot but if you have leftover, it’s even better the following day. how delicious! i love the fact you used whole wheat flour here! perfect! Wheat flour in focaccia sounds real good, Ivy. And olives too. Makes for a healthy bread, all around. Wow that doesn’t look too hard but it sure looks yummy! My family loves olives so this focaccia would not last long! Great idea to use wheat flour. I, too, like the idea of the whole wheat instead of white flour. 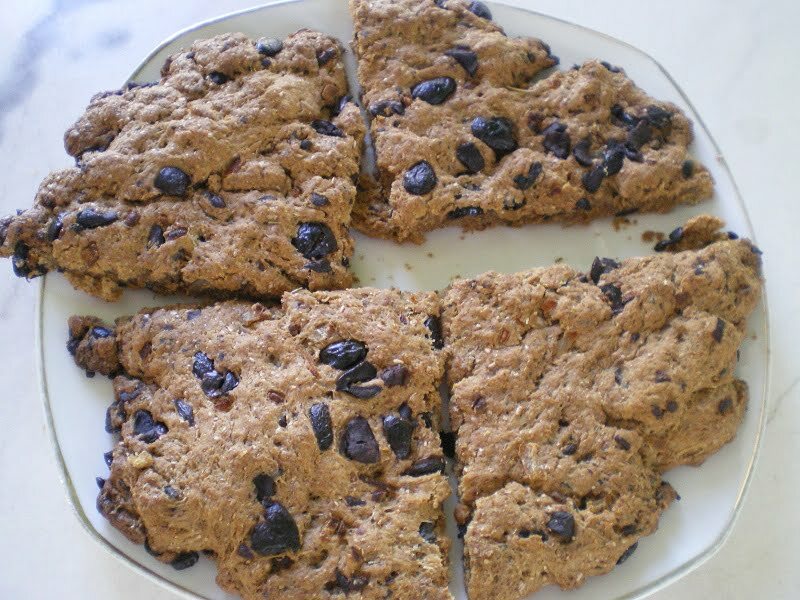 Ivy, I love lagana…and this recipe for whole wheat focaccia you have provided looks so healthy and aromatic. Like you said, quite easy and delicious! Instead of Kalamata I could use our local black olives. A healthy and tasty focaccia! Homemade breads are one of those comfirting foods. The thought of the smell alone all through the house is enough to start me on a bread making kick. It reminds me of my childhood when my dad would bake bread. It was a good read. A lot of information which i didn’t know. I remember you writting in one of your earlier post that you inlaws send you olives. Looks great! I bet the olives give it a lot delicious flavor. Absolutely scrumptious. Send some over please! What a wonderful foccacia. I’ve been subbing whole wheat flour for everything so this one really appeals to me! what a lovely bread and that too with whole wheat! wow! When I first looked at the picture I thought – oh cool, what a nice way to make chocolate chip cookies!!!! Then I realized that the cookie dough is bread and the chocolate chips are olives and thought “perfect, now I don’t need to eat the sugar”. What a fab loaf Ivy. I’m impatiently waiting for the weather to warm up so I can try this. It’s beautiful!! This looks so satisfying and delicious with the kalamata olives. Lovely bread! looks delicious! crispy n perfect ivy! Hi Ivy, your focaccia looks really fabulous!! i would love to break off some and taste it -mmmmmm…. It really is lovely to be back blogging again due to illness and viewing your lovely creations. Looks delicious Ivy! I have been meaning to get into making breads for my family but just can’t get into that rhythm. I reall yneed to start soon though. What a great focaccia! It looks really delicious with the whole wheat and the olives. Homemade Kalamata olives?! I’d love to hear how it’s done. check out EFM-Savory sreies round up and join with us in the EFM-Microwave oven series! Just a quick note to say many thanks for all those lovely recipes especially for continuous Cypriot and Greek recipes. I am soooo happy to find your blog..you are like my mother in low that i dont have anylonger….in the best possible way. Recently i tried doughnuts and carrot cake….they were very good indeed. Thank you and all the best with all you do. Nice to hear from you again Eva. Thanks for your kind words and I am really happy that you have enjoyed some of my recipes.